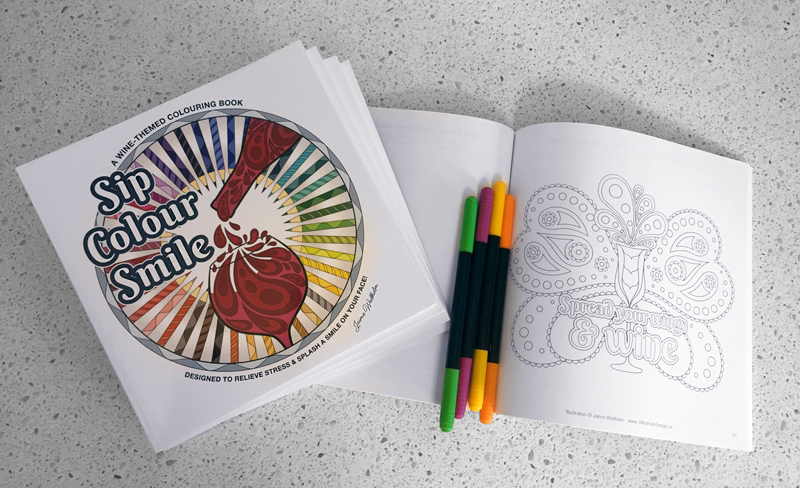 A wine-themed colouring book for grown-ups designed to relieve stress and splash a smile on your face! If you enjoy the tranquil and meditative effects of colouring and love your wine, THIS BOOK IS FOR YOU! I can’t wait to sit down with a glass of wine, relax and get lost in these fun, creative designs. I love that each picture has a sense of playfulness and the designs just beg to be coloured. Awesome book full of great unique designs that are fun and easy to colour. It’s colour therapy for your heart and mind. Great gift for BFFs, family, clients and teachers! Nurture your mental health and well being with every colourful stroke. Pages are single-sided with an extra blank page between each design to compensate for bleed-through. 17 designs that vary from simple to complex offering something for every skill level. Unplug from your hectic life with a glass of your favourite vino and colour your way to a stress-free state of mind. Better yet invite some friends over, pop the cork on a bottle and immerse yourselves in colourful conversation. Get your zin… ahem.. ZEN on! Also available at these awesome vendors!